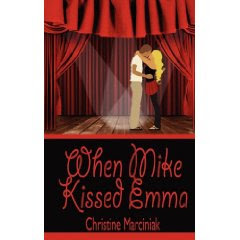 When Mike Kissed Emma by Christine Marciniak. Climbing Rose Press. 2009. Personal copy. The Plot: Emma's life is perfect. Boyfriend? Yep, she has the perfect boyfriend, Trevor. Best friend? Lauren, BFF since preschool. Family? Ok, sometimes big bro Jake can tease a bit too much and little sis Sara needs a bit of confidence, but these three like each other and hang out together. School play? Yep. OK, well, she hasn't actually gotten the role of Leisl in The Sound of Music yet -- but she's confident she'll be playing Leisl to Trevor's Rolf. What could ruin her perfect life? Getting the lead role of Maria. Which her BFF wanted. So Lauren is mad at her. And Trevor got the role of Rolf -- opposite Sara. Somehow, Sara is mad about that. And tattooed Biker Mike got the role of Captain von Trapp, because it turns out he can sing and act (not too mention some amazing blue eyes.) She's hanging out with him, reading lines, and no one is happy with that. What's a girl to do? The Good: As I explained on the release date for When Mike Kissed Emma, I have been friends with the author for a very long time. Not only that; but I've read all drafts of the story. To be totally honest? There is no way I can give this book an impartial review, both because of my friendship with Chris and because I know this book, I've seen it grow, like a niece or nephew. I love this book -- but I think it's only fair for you to know that connection. Wow, that is one big disclaimer / notice! 1. Emma's voice. When Mike Kissed Emma is told in first person, from Emma's point of view. She starts confident -- and then realizes that what she thought was true isn't. She has to readjust how she sees things; but even with realizing that some things aren't what they seem to be, she still has confidence in herself. 2. Dialogue. Whether it's Emma talking with her friends, arguing with her siblings, turning to her mother for help, or flirting with Mike (even though she would deny that it was flirting!) the dialogue is both true to life and funny. 3. The use of the play in telling the story. On the one hand, it's about a high school play and the drama that goes on around it. It could be almost any play; and any play with a romance for Mike and Emma to play against each other and fall in love. Marciniak makes use of this particular play, The Sound of Music: the dialogue, dance scenes, songs, all are not only woven into the story but also illustrate and illuminate points along the way. 4. The cover. Covers are so important; they can make or break a book. Oh, a talented librarian or bookseller can sell the greatest book with the worst cover, but only if they have a chance to booktalk it. A cover, basically, has to booktalk a book without words. I like that it isn't a photograph; some photographs on books are too bright, too photoshoppy. Instead, we have a boy and a girl, kissing, slightly off center stage. It fits the title of the book; it's inviting; you want to pick up the book. 5. The readers as well as the characters learn a thing or two. I wouldn't be surprised if the readers come to a conclusion or two before Emma, Mike, & company. But that's good; you don't want to spoon feed it all to the reader. A book shouldn't tell them something is wrong, or right; the reader should be able to figure it out themselves. Thanks, Liz - and you were integral in this story even getting written in the first place - so some of the credit goes right back to you! This looks like a fun read. I'm going to add it to my list of books for sure! Thanks for the kind words, ReaderGirl and Michelle!